Not only does this year mark the 50th anniversary of Yanmar’s first excavator, Yanmar also set a new industry standard with its new four-year/4,000-hour bumper-to-bumper warranty on all of its excavators. Starting with the launch of the world’s first compact excavator in 1968, Yanmar has since expanded its excavator offerings to eight models, six of which have true zero tail swing. Each excavator is purpose-built to overcome the most challenging conditions, work with an efficient use of power, conserve fuel and provide flexibility with the same stability and performance you would expect from more conventional excavators, says Yanmar. In 1993, Yanmar launched the ViO Series of excavators, which was the world’s first zero tail swing excavator and is currently marketing its sixth-generation model. The ViO development objective of turning within the machine width has been successfully achieved, while still maintaining the stability and work performance of a conventional-style unit. With a zero tail swing excavator, no part of the housing extends beyond the track, which allows efficient operation in tight spaces, access to more jobs, less damage to the machine and less damage to the site. Yanmar produces six models in the ViO Series, ranging from 3,836- to 18,136-lb operating weights. For starters, the ViO17-A is equipped with a 14.5-hp Yanmar diesel engine, 3,836-lb operating weight, 7-ft, 7-in. digging depth and variable width tracks of 3 ft, 1 in. to 4 ft, 1 in. On the other end of the spectrum, there’s the ViO80-1A, which is engineered with a 56.9-hp Yanmar diesel engine, 18,136-lb operating weight, 15-ft, 4-in. digging depth and a width of 7 ft, 5 in. The advanced technology true zero tail swing ViO35-6A, ViO50-6A, ViO55-6A and ViO80-1A feature an electronically controlled Tier 4 Final engine and dramatically evolved hydraulic system. They also come standard with Eco and Auto-Deceleration modes for even more operational efficiency. All of this means these models can deliver up to 20 percent less fuel consumption than previous models. The ViO Series excavators utilize multiple variable displacement piston pumps and gear pumps. The load sensing pumps in combination with Yanmar’s hydraulic circuitry design allow fast, smooth and powerful performance, even when combining functions of the boom, arm bucket and swing. The new digital SmartAssist control system allows you to monitor up to three months of operational history. This system centralizes control of machine operation information and maintenance support information. Additionally, Yanmar offers the SV Series of ultra-tight-turning excavators, each of which have a minimal turning radius in both the front and rear. This tight turning radius adds versatility on a tight worksite. Yanmar has two models in its SV Series. The smallest model is the SV08-1B, with a 10.3-hp diesel engine, 2,348-lb operating weight, 5-ft, 4-in. digging depth and variable width tracks of 2 ft, 3 in. to 2 ft, 9 in. The largest model is the SV100-2A, with a 72-hp Yanmar diesel engine, 21,550-lb operating weight, 14-ft, 10-in. digging depth and a width of 7 ft, 7 in. All Yanmar excavators starting with the ViO25-6A up to the SV100-2A come standard with Yanmar’s proprietary quick-coupler design. The quick-coupler significantly reduces the time to change excavator attachments and can be done from the comfort of the operator’s station. “Reliability, versatility and dependability are key when looking to purchase a compact excavator. 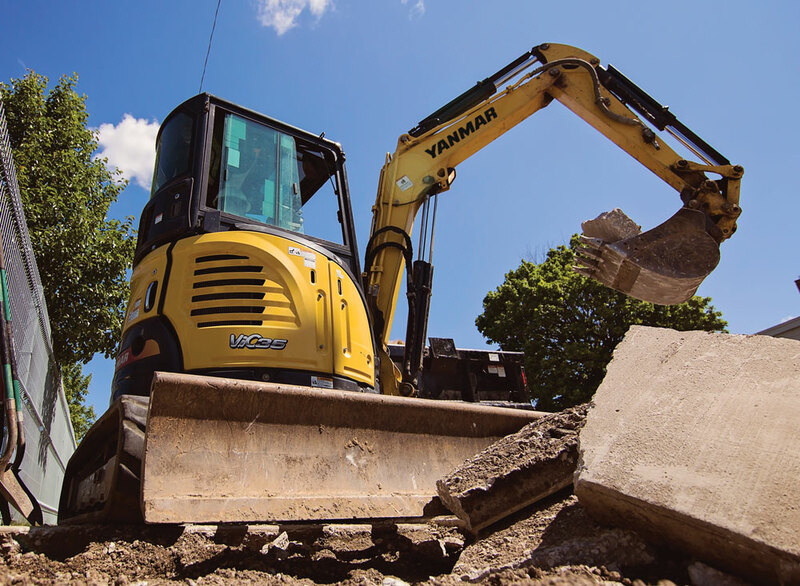 Ease of changing buckets and attachments with a hydraulic quick-coupler and a warranty that backs the craftsmanship of the machine are also advantageous to the consumer,” explains Jeff Pate, national sales manager for Yanmar America’s Construction Equipment Division. Learn more about Yanmar here.